The City of Toronto and TTC are reconstructing the streetcar tracks on Kingston Road between Queen Street East and Victoria Park Avenue. This is regularly scheduled work to ensure that the tracks are in good repair and stops are compatible with the new accessible streetcars. To speed this project, it has been separated into two contracts that will be conducted simultaneously. Noise will be kept to a minimum, but is likely to happen. Parking, traffic lane/turning restrictions will be imposed, as well as changes to transit service/routings. We are working hard to ensure that residential side streets are impacted as little as possible and that pedestrians retain access to businesses. Heavy construction work will typically take place from 7 a.m. to 7 p.m., Monday to Friday, and from 9 a.m. to 7 p.m. on weekends. To meet project timelines and the return of streetcars, periods of late evening and overnight work will be conducted during phases of rail installation. 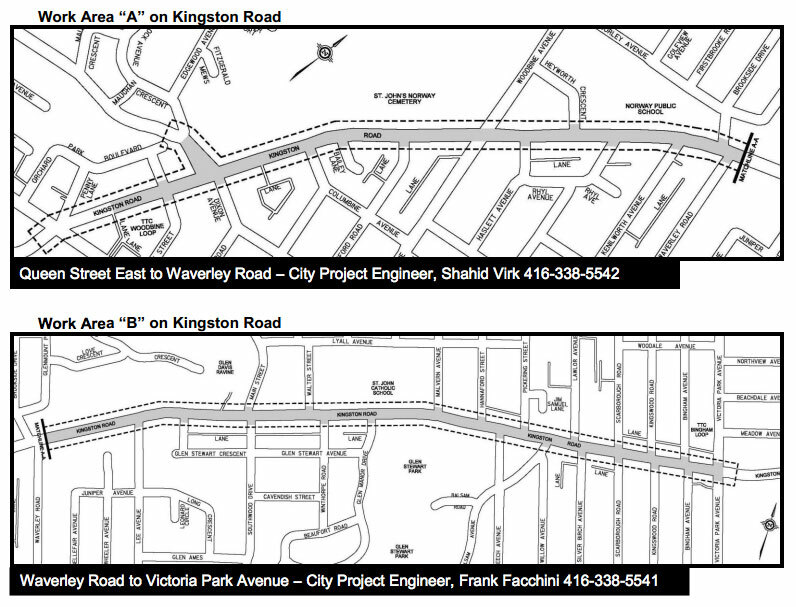 The TTC will carry out rail welding and rail storage on Kingston Road prior to the start of the project. During this period, buses will replace streetcar service and the roadway will be reduced to one lane in each direction. Routing changes will be made to the 502 Downtowner, 503 Kingston Road streetcar routes and to the 22A/322 Coxwell bus route. Service levels on the 92 Woodbine and 64 Main bus routes operating to and from the Danforth subway line will be increased. Details of the transit changes will be provided in May by way of a notice, postings on the TTC website and at transit stops along the affected routes. A drop-in event will be scheduled for mid-May. At the event, you can review information panels with details about the construction and speak one-on-one with project staff. The date for the event will be sent out in a follow up notice to the community. You may also check the project website. Further details about the construction will be provided in a future notice prior to work beginning. The notice will provide a more accurate timeline of construction activities and its impacts on neighbourhood transit, road and sidewalk access. Both the City and TTC web sites will be updated with additional information as work progresses; www.toronto.ca/improvements or www.ttc.ca (Service Advisories – Construction) or @ttchelps twitter.